After Eyes Of Love and Compass Waves Of Grace is Eric's third installment. Musicians on the new album are Eric Evans (flute, alto flute, EWI), David Eugene Ivey (vocals, acoustic guitar, keyboards), Cecil Ramirez (keyboards), Brent Bourgeois (keyboards, vocals), Steve Laury (electric guitar), Lance Taber electric guitar, acoustic Guitar), Curtis Harvey electric guitar), Michael Roe (electric guitar), Ralph Stover ( drum programming, bass), Eddie Ramirez (bass), Matt Sawhill (bass), and Bruce Spencer (drums). Awesome melodies like the romantic ballade February Clouds perfectly fit to his lead instrument. Only You Can Believe features Ex-Fattburger and guitar legend Steve Laury, who mesmerizes with fantastic guitar riffs. 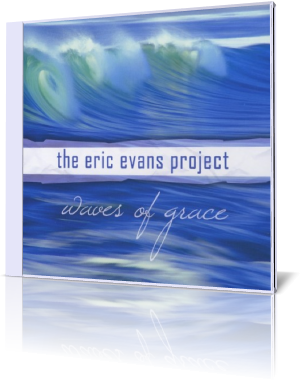 Eric Evans' sense and talent for fine melodies finds its expression in Waves Of Grace. A great exposure for singer David Eugene Ivey. His passion for life, friends and music reflects in the intricate rhythms that brings the project Open Skye to life. Driving along the ocean side the Shoreline Highway is a beautiful preparatory for the spectacular view. But at special times you want just to be at Home and listen to David Eugene's vocals. All across the world is a new awakening and the hope for a better day. A New Dawn underlines this moment and mood of the young day. Walking along the borderline between New Age and Smooth Jazz Brent Bourgeois brings some Pop elements into this album with Will You. Eric Evans builds with his flute a brilliant instrumental bridge. Lance Taber excels on There's One Way with his professional guitar performance. You can hear his guitar playing and production work on many of the songs on the popular Guitar Hero and Rock Band series of video games. Sometimes a song has such a mighty beauty, that you are just fascinated by the sound. You Are My Provision would be a great movie score about the breathtaking nature. Superb! Friends of the music of Vangelis should give Finding The Reasons Why a listen. Airy flute and synthesizer in the reverb paradise. The love ballade All Of My Love is a worthy final of this charming album. Waves of Grace is a heavenly place beyond all genres for Eric Evans' divine flute. Beauty in pure notes.